I’ve had experience with beer festivals in the past, but I wanted to give my perspective on this four-day experience. This was not my first trip to Colorado or my first experience with craft beer; those came over a decade ago. I had seen the state from the back of a 90’s Nissan minivan as a child and the first Colorado beer I tasted was at Pug Ryan’s Brewpub in Dillon back in 2006. A lot had changed in Colorado since that first sip as a 13 year old, but the sight of the Rocky Mountains the next day had me excited as ever. Flying out of East Tennessee is never easy and never direct. Gratefully, the Denver coworker I was crashing with retrieved me from the airport and we headed directly to a bar downtown that had just tapped a keg of Unfiltered Pilsner Urquell. The memories of my knees cramped up against the seat in front of me faded quickly as we downed mugs of the world’s first Pilsner beer and connected with friends new and old. My bed for this four-night beer marathon was this coworker’s couch, complete with what any visiting dignitary may need, a Dora the Explorer blanket. As I woke up the following morning to the third alarm, I peeled out from underneath the blanket and woke up my coworker to start our day. I had prepared a list of places of interest for while I was in town and I was determined to see them all, but I was really in Denver to experience the festival. We headed to the Convention Center to meet up with Lisa Zimmer, who manages the GABF booths for our MillerCoors brands. We’d offered to help with set-up in exchange for a sneak peek at the GABF floor before it was flooded with fest-goers. Lisa creatively put all 6’6” of me to work hanging signs. #tallguyproblems. Crews were working left and right, placing the final details on each booth to make sure their beer would be noticed by all of Denver’s temporary inhabitants in the coming days. After some speedy ziptie work and a lap around the floor, we headed out. Later that day, with my Hawaiian shirt on and our tickets ready we walked into what seemed like the longest living organism on planet earth. It was incredible to see the line of people wrap around the Colorado Convention Center, but also a little intimidating. My first reaction was if this was the outside, then inside would be a zoo of chaos and destruction. What I found however was an extremely efficient system to move everyone safely inside and to get him or her to the beers they so anxiously were awaiting. I applaud the workers at the festival who checked in everyone because once we entered the building any anxiety about it being over crowded was washed away. We received our plastic tasting glasses (which was a good decision by festival organizers) and began devising a strategy to try as many beers as possible. I had access to all four sessions, but being my first time attending I sampled the first session as if there was never going to be another festival. This was delicious and tiring at the same time, my palate was surveying styles and breweries I had never tried and only heard about. However, this was a mistake and hindsight I would advise to try to go to two sessions at least because there is too much beer for four sessions, let alone one. I did the math and if I drank two beers a day, everyday, it would still take almost 10 years to try all of the beers at the festival this year. With that in mind, I took day two at the festival very differently. We entered the festival like normal for Friday’s first session except this time we sampled slower and enjoyed the moment. I was introduced to the Revolver Brewing Company brewers, Russ from Lakefront Brewery, and several others whom were all warm and very welcoming to all of the visitors at the festival. With more time, we were able to try breweries at the festival who had achieved the popular vote like Bottle Logic, The Rare Barrel, Lord Hobo, Two Roads, Cigar City, and so many more. There was always a line, but we had time. There was no rush and it made the festival more enjoyable. At this point I most likely would make the trip back next year. With the final day of the festival came the awards ceremony and some lovely glassware. I walked down the hall towards breakfast and the ceremony. As we took our seats, I was thrilled to spot breweries I admired like Mikkeller and Avery Brewing Co.. As we sat I shuffled between my grandfather’s old Minolta 35mm and my new DSLR. Remember when I said plastic was a good choice? I was holding too much as I was seated, two cameras, an apple, and a lovely snifter. As I looked for my lens cap I placed my snifter in my front pocket. Naturally, as all good things must come to an end, so did my snifter. As I bent over to look for the lens cap, the glass fell out of my pocket, onto the concrete, and with it a subsequent shatter rang throughout the room. I had just successfully attended my first GABF awards ceremony and looked like a total tourist and fool after his first beer. Following the ceremony we walked into the festival for the remaining sessions and continued to make rounds. I grabbed another plastic taster glass because I wasn’t worthy of the glass snifter. There was a different pattern of movement on the final day; everyone walked around looking for the breweries that struck gold. I was fortunate to try ZwanzigZ’s chocolate ale from Columbus, Indiana without waiting in line. This medal winning brewpub was positioned next to New Glarus, which drew all of the drinkers on the Midwest aisle. Leaving the Midwest, I walked towards the front of the building where I noticed Eric Salazar pouring himself a sample. Between sessions I took a break from festival activities and headed toward Falling Rock for a pint of Blind Pig from Russian River. It was great to finally have a full beer for a change and enjoy the outdoors. After the pint was finished, it was back to the festival. I refrained from excess and got ready for my shift that evening at the Leinenkugel Booth. I felt completely comfortable to pour beer for a family brewery whom I had shared several beers with earlier in the year. I gave away the bandana I wore to a woman who said it was her birthday and poured Summer Shandy, Maple Dunkel, Oktoberfest, and more until the festival finally came to a close. We all walked out said our goodbyes and called it a wrap. Thinking back over the last month, its dawned on me what my thoughts are on GABF. More established breweries this past year withdrew from getting caught up in the festival in favor of other smaller events around Denver. 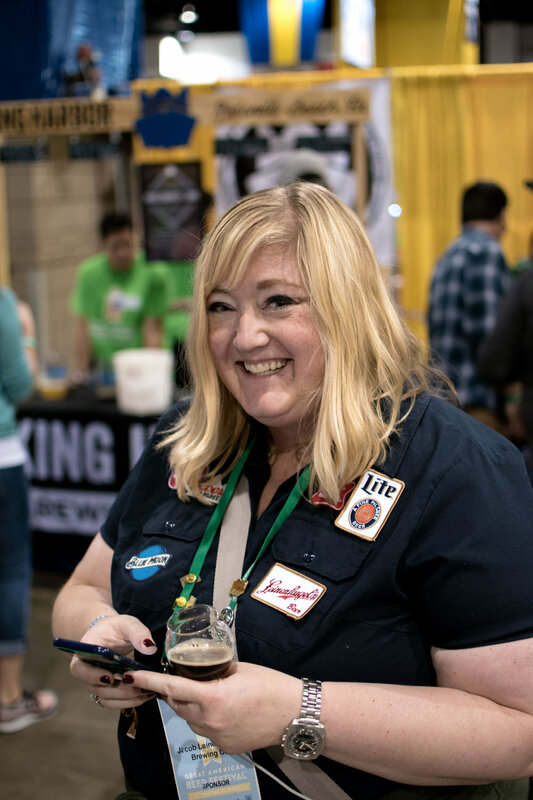 GBH contributor Dave Eisenberg wrote why these breweries made the decision, but I think there is still a valid reason for breweries to get excited for GABF and to attend. For visitors like myself, GABF is an opportunity to try the breweries we may never get the opportunity to otherwise because of financial, work, or other personal reasons. It isn’t feasible for most drinkers to go to each corner of the country to try beer from breweries they respect. Even though a brewery like Russian River may never distribute to Tennessee, I have the opportunity to try several of their beers in a space across the aisle from The Bruery. In the future, I’ll look forward to the new breweries that eagerly await the possibility of winning a medal. Following the awards ceremony misstep, I look forward to the revisions that will surely happen with the categorization of breweries. The festival that helped build beer culture in the United States will continue to be something of a pilgrimage to drinkers like myself and I believe it should continue to attract world-class breweries from around the country, no matter the size. Ultimately, I experienced GABF for the first time and met with some phenomenal people. When I look back at GABF it’s not just the festival, it is the Superbowl of beer. A week filled with adventures inside and outside of the event that sometimes includes a Dora the Explorer blanket. Will I go again next year?